It's no secret that Nintendo's iconic red-wearing plumber has had a number of vocations. From referee to painter to kart racer to hotelier, Mario's been through a lot and shows no sign of actually doing some plumbing. Keeping that in mind, let's take a look at a game where he becomes a pinball. 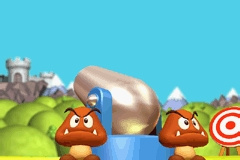 Super Mario Ball's plot revolves around a new contraption built by an undisclosed entity called a Pinballer, that allows the residents of the Mushroom Kingdom to use devices known as Sky Cannons; Princess Peach gets kidnapped by Bowser after Goombas take control of a Sky Cannon and fire her into the tyrant's lair. It's a fairly standard Mario plot with the necessary context as to why he must navigate in the unusual manner that the game dictates, but we didn't come here for a deep and compelling story, we came here to see Mario flung around a pinball machine crying out in yelps of pain as he strikes the many obstacles in his path. The aim of the game is to collect Star Keys from different parts of the Mushroom Kingdom in order to enter Bowser's castle and save the Princess; in order to do this, you have objectives that you must fulfil in order to obtain Power Stars. The game is littered with dozens of different areas that you have to navigate using only your paddles, and that's where we hit our first problem. The controls and physics are rather well done, but the speed at which everything happens and the relatively small doors that you need to go through in order to progress are often either too difficult to enter or too easy. 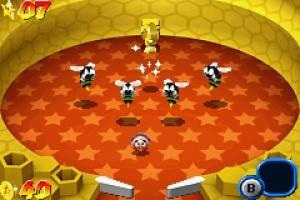 Many times you’ll find yourself repeatedly missing a door that was directly in the centre of the area, or worse still unintentionally flying through to another area before you’ve obtained the Power Star you’d worked so hard for. The difficulty of the game is difficult to pin down – the erratic movement means that you can spend much longer than you think you would trying to get a particular Star when the one you picked up just before was obtained on the first try. This makes it infuriating at times, but infuriating’s good, infuriating gets things done. No matter how quick you are to put down the game in frustration, its whimsy and charm will soon claw you back into it. Some of the challenges become more about determination and principle than fun and enjoyment, but experiences so unforgiving are few and far between. Expect to see some familiar bosses such as Petey Piranha and Big Boo, too, some of which have some really interesting mechanics which really help to spice up the gameplay. This is strongest in its visuals — the bold, bright colours leap off the screen and make you very aware of the environment you’re in. Although they’re borderline blinding, the colours have been picked very carefully so you’ll never lose sight of Mario against the tables. The sprites themselves are nearly all made up of pre-rendered 3D models in a fashion made famous by the original Donkey Kong Country, and even though it’s a dated method by today’s standards Super Mario Ball looks unashamedly gorgeous. 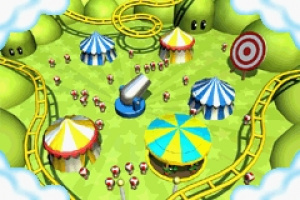 Many of Mario’s familiar foes have returned in some form or another and look better than ever for 2D sprites, and the familiarity doesn’t stop there; most of the sounds are taken directly from other games in Mario’s extensive series such as Super Mario 64 and Super Mario Sunshine. Whilst some may argue that this is a lack of originality, recognising the little bleeps and jingles from such stellar games is just another reminder that the game is all about Mario, after all. This isn’t the longest experience you’ll ever get from a game, with the main boss falling in a little under four hours, but there are enough extra stars to get a couple more hours out of it. There’s also the Time Attack Mode, which pits you against the clock in order to beat a world’s boss in as fast a time as possible. It doesn’t really feel any different to the main Adventure Mode, but it fleshes out the experience a little and allows you to re-fight the bosses, which you can’t do in Adventure Mode once you’ve defeated them. Super Mario Ball holds its own as an oddball (pun intended) of the Mario spin-off series – a wholly single-player experience with beautiful visuals and an interesting medley of Mario and typical pinball tropes. It’s not without its flaws, and the gameplay may cause some to become more frustrated than perhaps is healthy, but the good experiences with this certainly outweigh the bad. Whilst you won’t get a tremendous number of hours from it, it's a ten year old game that you can download for 20% of its original price, and that makes this off-the-wall title worth a look for anyone looking for a more challenging romp through the Mushroom Kingdom. I used to enjoy playing this on my GBA, so I may get this when I get some spare cash. I would love Zen to make some Nintendo themed pinball games considering how good their other tables are. I agree. There are many people out there who will claim this game is terrible, but they're just letting a few frustrating moments get to them too much. I played the game for years when I first got it (as Mario Pinball Land, American auntie got it for me). Love it, though Bowser's a pain in the 'A' and the temporary saves are a bit inconvenient; the latter doesn't apply as much for the Wii U. Still, everything else was a good time. Whenever I was annoyed, I just went back to it hours later! Metroid Prime Pinball was much better, it had at least better physics. I love pinball, but usually I don't like this kind of fantasy pinball. I should give it a chance sometime though, since I do enjoy Pokemon Pinball, but in the end I prefer real life or similar to real life pinbal, like The Pinball Arcade or Pinball Pulse: The Ancients Beckon. (Made by the same people who made this game) And then there's also this! I might have to look into this if they decide to release it in North America. IF being the key word. When it comes to deeper mobile pinball games, i always go with the pokemon ones, or Metroid Prime pinball, that one was great too. Surprisingly favourable review for this one from Fuse Games/Silverball Studios, in my opinion. I think it's a duffer. However, their next pinball games, Metroid Prime Pinball and Pinball Pulse, were absolutely stellar. Not saying this game was bad, but I never really enjoyed it when I was little for whatever reason. I'm not sure if I found it repetitive or if I didn't like the physics. Looking back, however, the game looks really good visually and I kind of want to at least try playing it again. I really prefer Metroid Prime Pinball. IIRC, theres no save file. Wow guys I really want to play this!! It would be good to play it on my GBA SP though maybe I should try to find a gamepak online first and if not download. The game looks a lot of fun and has lots of charm. which is better - this or sonic spinball? It's a shame I am simply not into pinball, or else I would definitely give this game a go! Bah! Come on, Nintendo! Put this (and Pokemon Pinball GBA) on 3DS!! I might be the only one, but I do not want Game Boy games on my Wii U. It just feels wrong. Balls to the wall, balls to the wall! A licensed Mario (or Zelda, DK, etc) table by on Zen Pinball would expand the franchise universes without taking away sales from Nintendo consoles!! 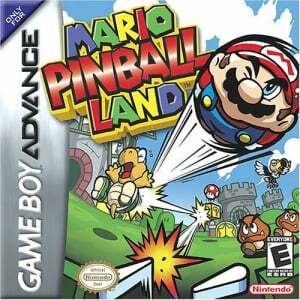 Pinball makes sense with round ball shaped characters like Sonic, Kirby and Pac-Man but not Mario. "we came here to see Mario flung around a pinball machine crying out in yelps of pain as he strikes the many obstacles in his path"
Lol. Doesn't this sound a bit sadistic? Anyway, I'll download it someday. This game can feel unfair and no, they aren't the best physics, but I still loved the game as a kid. Will I buy this sometime? Probably not. Zen Pinball is good enough. @B3ND3R Woah, that sounds awesome! I've played Tron before quite a bit at Disney Quest (It was one of the very few pins there that was in good shape) and really liked it. Bride is cool too, but I've only played The Pinball Arcade version. Never played Cyclone but I know a lot of people really like it. I don't own any machines yet, but one day I'll save up enough... one day... In the meantime, TPA, my Future Pinball designs and my two table top pins (one of which is broken, and my attempt at repairing it made the issue worse ) will have to do! NA please? This may be the only Mario game I have never played (CDi games don't count). May have liked this game before, but now, it's painfully difficult. Getting coins is a chore. One of my favorite games of all time. I'm 45 and remember playing this the entire day I was waiting for my youngest son to be born. I recently played this on a modern day big screen and was blown away with how well the game holds up. Everything pops. I do have to say that I have always found it rather challenging and for as many hours as I have sunk into it have only made it about half way through the game. Only recently did I discover through a video that there was so much more I had never found. Check this out, it is a true gem, and one that I wish Nintendo would give an updated take on. Difficult game but it really does bring you back for more due to its unusual stages which are wider than in normal pinball games. Fuse, the developer, later made the excellent Metroid Prime Pinball. I have this game. Played it a lot when I was young! Managed to get all the Golden Eggs, Blue coins and all the power stars. If you get a highscore without losing, you enter a special bonus after you beat the game. I can understand that the game may not be for all Mario fans out there since the game can get frustrating especially in the final stage but I had a great time with it and in the end that's all that matters. Its a shame that Nintendo isn't gonna put more effort into this pinball game because out of all the pinballs that I've played, this one's the best! I never actually thought Nintendo would port this game because I thought this game wouldn't have sold well. @dizzy_boy — Good call, buddy. That w/could be seriously cool..
"Nintendo, meet Zen. You guys have much to discuss". "Mario's been through a lot and shows no sign of actually doing some plumbing." Played the hell out of this game on my GBA SP and i absolutely loved it. Wish Nintendo would start releasing GBA games on the 3ds, as i think this type of game is a lot more enjoyable on a handheld. I hope to play Metroid Prime Pinball one of these days. I think I'll pass on this one. Mario, Zelda, Metroid, Star Fox, Kirby, to start with? I HATED THIS GAME.. this game is more like 5/10 because of the horrid physics. you can't predict where the ball will go. try over and over until you get through an opening.. so frustrating. NOW gameboy getaway .. that had good physics.. It sounds pretty good, but I'll pass in favor of possible VC releases of "Metroid Prime Pinball" and "Pokémon Pinball: Ruby and Sapphire"